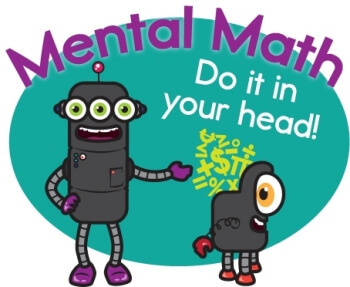 Are you dealing with parents who complain to other parents that their kids are bored with the math being taught to them at school? 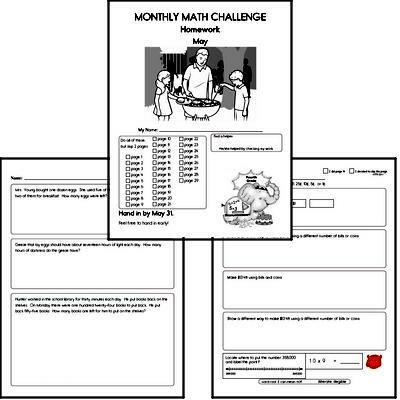 Give gifted kids and those kids above grade level something new each month to enhance their math learning. 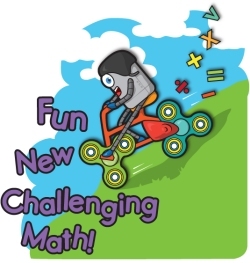 Kids want math to be both fun and challenging. Gifted children may have problem-solving and critical-thinking abilities that go beyond their grade level. These are not monotonous factual math skill practice books, but encourage creative thinking and tackle life skills. Students need to show their thinking and will truly triumph when they discover the solutions for themselves. 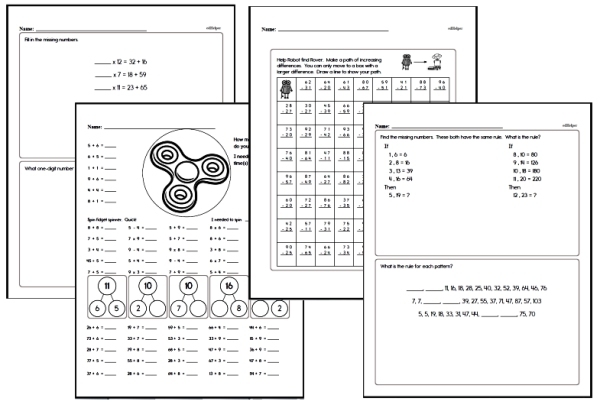 Try these ready-made homework workbooks (or use in the classroom) to enhance your mathematics curriculum. 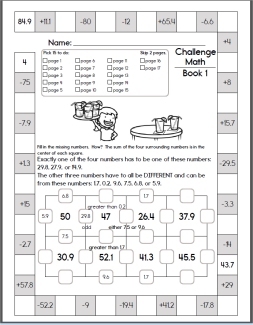 Make these fun math practice books whenever you need some extra math practice. 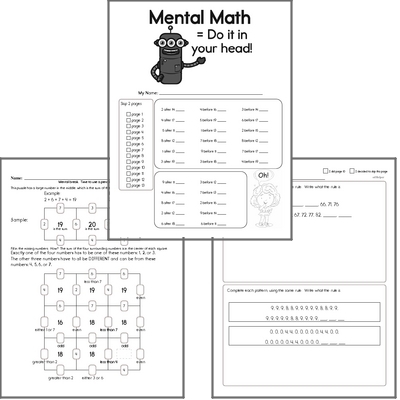 Kids love working on these fun mental math puzzles and challenges! While it is true that most gifted students will do well without any special help, it is also true that they will benefit from differentiated learning that fits their needs. Gifted students, perhaps more than any other demographic, have the ability to become self-motivated, independent learners. We want to keep every student engaged with learning, but how do we accomplish this daunting task? In an age where we are so focused on test scores and making sure every student is proficient at given tasks, gifted students are often put on the back burner-not intentionally, but simply because of a lack of time and planning for these students. Engaged students, no matter what their abilities, bring joy to the classroom. There is a quote that is popular in education: "Education is not the filling of a pail, but the lighting of a fire." Although the original author of this statement is unknown, the idea is something that appeals to most of us. How can we become the ignitor of fires in our students? Allow students choices to show what they have learned. Rather than taking a pencil-and-paper test or writing a paragraph, students could choose to show their knowledge and understanding by completing a project or by teaching other students. "Projects" may include writing poems, making posters and collages, creating podcasts or webpages, and so on. The simple statement "tell me more" invites students to delve a little deeper to display their learning to you. Offer a variety of texts and ask higher-level questions to challenge students to increase reading levels and to make connections for themselves between reading and learning. Nonfiction books on particular subjects can often be found with multiple texts on various reading levels. Your class can study one topic using a variety of texts that can be read by students at their own reading levels. It can be challenging to find fiction novels that are suitable for younger readers with higher reading levels. Enlist the help of your school or public librarians. You might be surprised to learn that graphic novels, while offering smaller blocks of text, often are written on higher reading levels. Encourage students to connect new learning to prior knowledge and to their own personal experiences. Incorporate technology in your lessons. Most kids today are hooked on technology, and this can be a powerful motivator. The variety of subjects and reading levels offered by the Internet can provide a wealth of learning options, especially for gifted students. SMART Boards, iPods, software programs, and Internet searches can extend and enrich classroom lessons. While in the past, teachers often used newspapers and magazines to support classroom teaching, now technology gives students access to an incredible range of learning opportunities. Help students set goals for themselves. Research has shown that setting goals has a powerful effect on student confidence and achievement. Gifted students are often perfectionists and need help setting realistic goals for themselves. Instead of having a murky and elusive goal of creating the "perfect" project, help students break the project down into steps so that they can see themselves advancing as they complete the work. For instance, the first step might be creating a KWL chart to document what they already know, what they want to learn, and at the end, what they did learn from doing the project. In the research phase, they could create a list of sources they are using and give reasons why they believe each source is a reputable and authoritative one. For the final product, help students create a rubric to grade their project. Have they met the criteria needed to get the "perfect" grade? If they have a guideline of the ideal end product, it will give them the knowledge and confidence they need to create it. Allow students the opportunity to reflect on their learning and to give feedback about lessons. How much did they understand about the subject? What are they confused about? What interested them? What would they still like to learn about the topic? How could they continue to learn about the topic on their own, and how would they demonstrate their learning? You could ask them to write a paragraph after completing a unit or fill out an exit ticket. Exit tickets are a simple tool that can allow students and teachers to communicate to each other about what is and isn't working in the classroom. Asking questions about learning can allow students to give teachers feedback about the efficacy of teaching methods as well as student interests and their engagement in school. Reinforce students' confidence in themselves. Research by Lucas (1990), Weinert, and Kluwe (1987) shows that teachers should give positive feedback frequently to support students' own beliefs that they can do well. We can assign tasks that are neither too easy nor too difficult. If teachers can help students find personal meaning and value in their learning, they may light that spark that will lead to students becoming self-motivated and life-long learners.